За отриманими у 2015 р. спектрами у смугах поглинання метану на λ = 727 і 619 нм відбивної здатності широтних поясів Північної півкулі Сатурна розраховано висотні залежності аерозольної і газової розсіювальних складових ефективної оптичної глибини. Оцінено зональні характеристики вертикальної структури хмарного покриву Сатурна. У широтних поясах виявлено аерозоль, відносна концентрація якого монотонно зменшується вглиб атмосферного стовпа, без ознак значного згущення і розрідження хмар. Найбільшу кількість аерозолю визначено для широтної області 49°N, найменшу — для області 80°N. Виявлено висотні рівні, на яких можливі зміни розмірів або природи аерозольних частинок. Рівень атмосфери з максимальною відносною концентрацією аерозольних частинок не було визначено, однак характер отриманих залежностей вказує на його ймовірне розташування в більш високих шарах атмосфери планети-гіганта. 1. Бугаенко О. И., Галкин Л. С., Мороженко А. В. Поляриметрические исследования планет-гигантов. I. Распределение поляризации по диску Сатурна. Астрон. журн. 1971. 48. № 2. С. 373—379. 2. Бугаенко О. И., Длугач Ж. М., Мороженко А. В., Яновицкий Э. Г. Об оптических свойствах облачного слоя Сатурна в видимом участке спектра. Астрон. вестн. 1975. 9. № 1. С. 13—21. 3. Видьмаченко А. П. Сезоны на Сатурне. 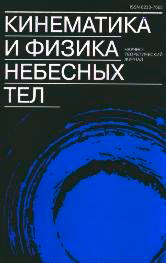 I. Изменение отражательных характеристик атмосферы в 1964—2012 гг. Вестн. астрон. шк. 2015. 11. № 1. С. 1—14. 4. Каримов А. М., Лысенко П. Г., Тейфель В. Г., Харитонова Г. А. Северное полушарие Сатурна — поглощение метана и аммиака в 2015 году. Изв. НАН РК. Сер.физ.-математическая. 2016. № 5. С. 97—104. 5. Мороженко А. В. О структуре облачного слоя Юпитера. Письма в Астрон. журн. 1984. 10. № 10. С. 775—779. 6. Овсак А. С. Определение вертикальной структуры аэрозольной составляющей в атмосфере Сатурна. Кинематика и физика небес. тел. 2018. 34.№ 1. С. 57—80. 7. Blalock J. J., Draham R. L., Holmes J. A., Sayanagi K. M. Zonal wind speeds, vortex characteristics, and wave dynamics in Saturn’s northern hemisphere. Bull. American Astron. Soc. 2013. 45. id.312.10. 8. Bugaenko O. I., Morozhenko A. V. Physical characteristics of the upper layers of Saturn’s atmosphere. Adv. Space Res. 1981. 1. P. 183—186. 9. Carlson R. W., Baines K. H., Anderson M. S., Filacchione G., Simon A. A. Chromophores from photolyzed ammonia reacting with acetylene: Application to Jupiter’s Great Red Spot. Icarus. 2016. 274. P. 106—115. 10. Chamberlain J. W. The atmosphere of Venus near cloud top. Astrophys. J. 1965. 141. N 4. P. 1184—1205. 11. Chanover N. J., Bjoraker G. L., Glenar D. A., Hewagama T., Baines K. H. Latitudinal variations of Saturn’s near-infrared spectrum. Amer. Geophys. Union, Fall Meeting 2005, abstract #P11C-0135. 12. Connerney J. E. P. Magnetic connection for Saturn’s rings and atmosphere. Geophys.Res. Lett. 1986. 13. P. 773—776. 13. Courtin R., Gautier D., Marten A., Bezard B., Hanel R. The composition of Saturn's atmosphere at Northern temperate latitudes from Voyager IRIS spectra: NH3, PH3, C2H2, C2H6, CH3D, CH4, and the Saturnian D/H ratio. Astrophys. J. 1984. 287. P. 899—916. 14. Dlugach J. M., Morozhenko A. V., Vid'machenko A. P., Yanovitskij E. G. Investigations of the optical properties of Saturn’s atmosphere carried out at the Main Astronomical Observatory of the Ukrainian Academy of Sciences. Icarus. 1983. 54. N 2. P. 319—336. 15. Fletcher L. N., Baines K. H., Momary T. W., Showman A. P., Irwin P. G. J., Orton G. S., Roos-Serote M., Merlet C. Saturn’s tropospheric composition and clouds from Cassini/VIMS 4.6-5.1 pm Nightside Spectroscopy. Icarus. 2011. 214. N 2. P. 510—533. 16. Hall J. S., Rilley L. A. A photometric study of Saturn and its rings. Icarus. 1974. 23. P. 144—156. 17. Janssen M. A., Ingersoll A., Allison M.D., Gulkis S., Laraia A., Baines K., Edgington S., Anderson Y., Kelleher K. Saturn’s thermal emission at 2.2-cm wavelength as imaged by the Cassini RADAR radiometer. Icarus. 2013. 226. N 1. P. 522—535. 18. Karkoschka E. Spectrophotometry of the Jovian planets and Titan at 300 to 1000 nm wavelength: The methane spectrum. Icarus. 1994. 111. N 3. P. 967—982. 19. Lewis J. S. The clouds of the Jupiter's and the NH3—H2O and NH3—H2S systems. Icarus. 1969. 10. N 3. P. 365—378. 20. Mischenko M. The program for computing far-field light scattering by polydisperse homogeneous spherical particles using the Lorenz—Mie theory. https://www.giss.nasa.gov/~crmim/publications/index.html. 21. Morozhenko A. V. New determination of monochromatic methane absorption coefficients with regard to the thermal conditions in the atmospheres of giant planets. IV. Jupiter and Saturn. Kinematics and Phys. Celest. Bodies. 2007. 23. N 6. P. 245—257. 22. Morozhenko A. V., Ovsak A. S. Dependence of the aerosol component of optical thickness and the relative concentration of methane on depth in atmospheres of giant planets. Kinematics and Phys. Celest. Bodies. 2009. 25. N 4. P. 173—181. 23. Morozhenko A. V., Ovsak A. S. On the possibility of separation of aerosol and methane absorption in the long-wavelength spectral range for giant planets. Kinematics and Phys. Celest. Bodies. 2015. 31. N 5. P. 225—231. 24. Ovsak A. S. Calculation of effective optical depth of absorption line formation in homogeneous semi-infinite planetary atmosphere during anisotropic scattering. Kinematics and Phys. Celest. Bodies. 2010. 26. N 2. P. 86—88. 25. Ovsak A. S. Upgraded technique to analyze the vertical structure of the aerosol component of the atmospheres of giant planets. Kinematics and Phys. Celest. Bodies. 2013. 29. N 6. P. 291—300. 26. Ovsak A. S. Changes in the characteristics ofthe upper layers ofthe jovian atmosphere from the data on the integral observations of the planetary disk. Kinematics and Phys. Celest. Bodies. 2015. 31. N 1. P. 25—32. 27. Ovsak А. S. Variations of the volume scattering coefficient of aerosol in the jovian atmosphere from observations ofthe planetary disk. Kinematics and Phys. Celest. Bodies. 2015. 31. N 4. P.197—204. 28. Ovsak A. S. Vertical structure of cloud layers in the atmospheres of giant planets. I. On the influence of variations of some atmospheric parameters on the vertical structure characteristics. Solar Syst. Res. 2015. 49. N 1. P. 46—53. 43. Ovsak A. S., Teifel’ V. G., Vid’machenko A. P., Lysenko P. G. Zonal differences in the vertical structure of the cloud cover of Jupiter from the measurements of the methane absorption bands at 727 and 619 nm. Kinematics and Phys. Celest. Bodies. 2015. 31. N 3. P. 119—130. 44. Ovsak O., Kostogryz N. The method of computer analysis a vertical structure of aerosol component in the atmospheres of the giant planets. AGU Chapman Conference on Crossing Boundaries in Planetary Atmospheres: From Earth to Exoplanets, Annapolis, Maryland. 24—28, June 2013, abstract W3. 31. Perez-Hoyos S., Sanchez-Lavega A., French R. G. Short-term changes in the belt/zone structure of Saturn’s Southern Hemisphere (1996—2004). Astron. and Astrophys. 2006. 460. N 2. P. 641—645. 32. Perez-Hoyos S., Sanchez-Lavega A. On the vertical wind shear of Saturn’s equatorial jet at cloud level. Icarus. 2006. 180. N 1. P. 161—175. 34. Santer R., Dollfus A. Optical reflectance polarimetry of Saturn’s globe and rings: IV. Aerosols in the upper atmosphere of Saturn. Icarus. 1981. 48. N 3. P. 496—518. 35. Sromovsky L. A., Baines K. H., Fry P. M. Evidence for Ammonia and water ices as the primary components of cloud particles in Saturn’s Great Storm of 2010—2011. American Astronomical Society. 2013, DPS meeting #45, id.509.08. 36. Sromovsky L. A., Baines K. H., Fry P. M. Saturn’s Great Storm of 2010—2011: Evidence for ammonia and water ices from analysis of VIMS spectra. Icarus. 2013. 226. N 1. P. 402—418. 37. Stam D., Banfield D., Gierasch P. J., Nicholson P. D. Near-IR spectrophotometry of saturnian aerosols — meridional and vertical distribution. Icarus. 2001. 152, N 2. P. 407—422. 38. Tejfel V. G., Karimov A. M., Kharitonova G. A., Kirienko G. A. Spectrophotometric study of Saturn’s atmosphere during a 16-year period (1995—2010). Astron. and Astrophys. Transact. 2013. 2. N 28. P. 121—134. 39. Temma T., Chanover N. J., Simon-Miller A. A., Glenar D. A., Hillman J. J., Kuehn D. M. Vertical structure modeling of Saturn’s equatorial region using high spectral resolution imaging. Icarus. 2005. 175. N 2. P. 464—489. 40. Vidmachenko A. P., Dlugach Zh. M., Morozhenko A. V. Nature of the optical nonuniformity in Saturn’s disk. Solar System Res. 1984. 17, N 4. P. 164—171. 41. Vincent M. B., Clarke J. T., Trauger J. T. The correi ation of zonal bands and zonal winds in HST/STIS images of Jupiter and Saturn. American Astronomical Society 10/2000, DPS Meeting #32, id.10.11. Bull. Amer. Astron. Soc. 2000. 32. P. 1008. 42. Weidenscilling S. J., Lewis L. S. Atmospheric and cloud structures of the Jovian planets. Icarus. 1973. 20. N 4. P. 465—476. 44. West R. A., Li Liming A Ring-‘rain’ influence for Saturn’s cloud albedo and temperatures? Evidence pro or con from Voyager, HST, and Cassini. American Astronomical Society. 2015, DPS meeting #47, id.502.08.